“The Importance of Music, A National Plan for Music Education” was published by the government in November 2011. It sets out new responsibilities and ways of working for schools, local authorities, and local music and arts organisations. 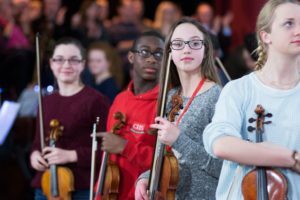 Music Education Hubs will develop a range of partnerships to deliver a wider and more coherent set of music education opportunities for all children and young people. The funding for Music Education Hubs is distributed by Arts Council England. The funding is for large group instrumental teaching in schools, providing ensemble opportunities, progression routes and a singing strategy. Manchester Music Hub will also provide professional development opportunities to school staff, an instrument loan service and access to large-scale and high-quality music events.